The Three who are in the great pouring sea. Above, below and in the great pouring sea, these Three occur throughout nature, throughout this Celtic culture. 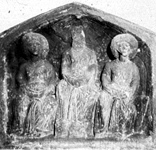 The Three who are in the Celtic stone reliefs convey these triadic ideals of a unified visual vocabulary, a consistent narrative and a singular spirituality, seen in nature, revealed in their art. The frequency of the number three as an aesthetic and spiritual structure signifies, through the figures present in art and myth, a correlation between the number three and fertility, protection, and sanctity in nature. In early Celtic Art the human head often appears in a triad, seen in the Glauberg Torc and the Rouillerot Torc, to comprise the decoration, to prefigure the narrative compositions of divine figures in the Romano-Celtic period, and eventually to influence Welsh and Irish literature.